I do like finding things out of the ordinary. Like this painting? mural? 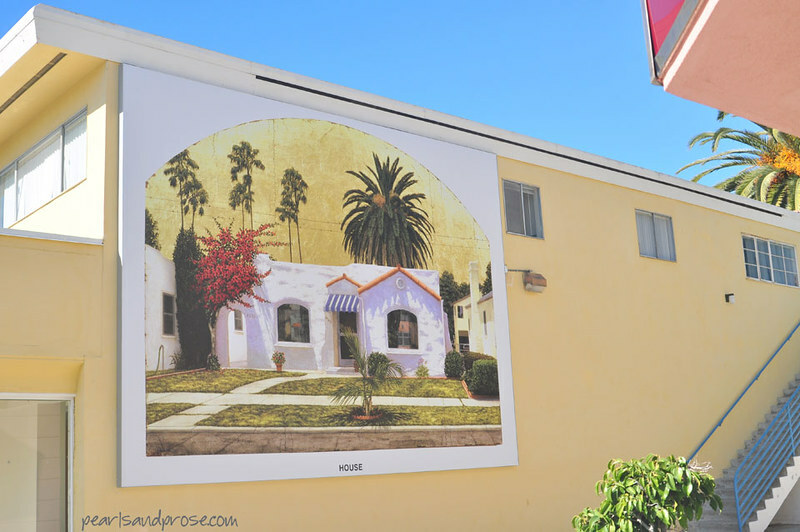 of a Spanish-style bungalow on an office building wall in downtown La Jolla. . . .
Did you know the word “bungalow” comes from the Hindi word bangla or house in Bengali style? I didn’t. 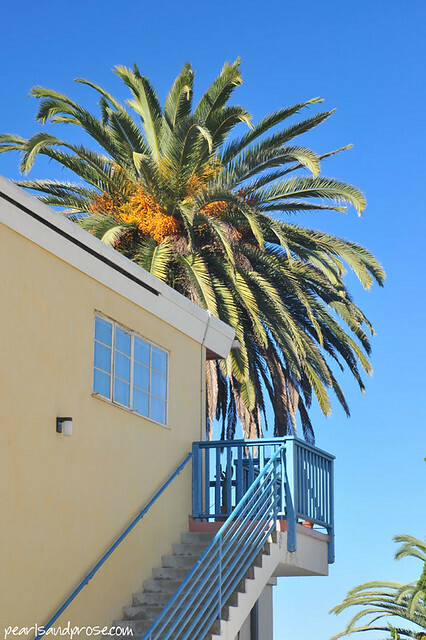 Climb the stairs on the side and you’ll find a giant Canary palm, my favorite. 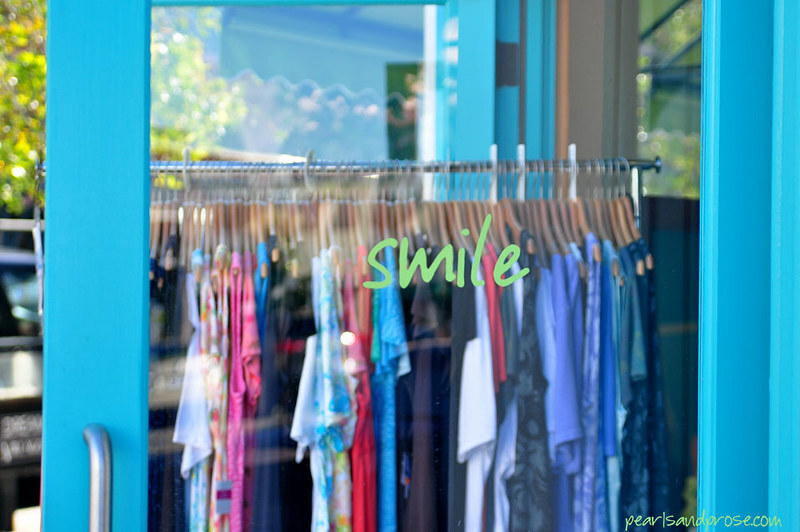 This entry was posted in photography and tagged boutique door, California, Canary palm, La Jolla, mural, smile, Spanish-style bungalow, yellow building with blue stairs. Bookmark the permalink. The steps and ultimate landing (climbing up) look like a cherry-picker attached to the house — the bangla. Related to the name “Bangladesh”, perchance? It’s a pretty unusual place for a giant painting/mural, but it’s as good a spot as any, given that it’s a huge wall with practically no windows. The blue in photograph #3 rivals the blue sky in the first two photographs. Way to go, Ms. Pearl. That’s a find. At first I thought it was a trompe-l’oeil but it’s a real painting. I had no idea about the origin of bungalow. I thought the same thing at first, Caroline. Would love to find out the story behind the painting. Me too, but not by choice. I average 6 hours a night and wish I could do more. I always sleep 8 -9. I go to bed quite early too… I’m useless with less sleep. I didn’t know the origin of the word either. I do miss the soft colors in this area. The pastels work so well with the light here. I once saw a similar bungalow on the East Coast and it looked so strange with all the colonial architecture. No, I did not know the origin of the word, “bungalow”. BUT, I have been to La Jolla. How nice to know there’s a chance you are walking the same streets I did! Fabulous photo array … I love the building colours set against the perfectly, blue sky, Carole. Thanks for that, Cheryl. La Jolla is a wonderful place to visit. Much too expensive to live there, though. I enjoy walking through city streets with big, beautiful murals like that. I read an article about the building murals around Marseilles, France. They are so well done, they almost look real. People often make the mistake of trying to open a door that is only a painting. I’d love to see the murals in person some day. I was in Marseille years ago, but only for a day, Jackie. Wonder if they were there then. A very interesting city–more Italian than French, in my opinion. I think it helps, Jennie. All the sunshine too.